We are always going on about good quality flour. But does it really make a big difference? 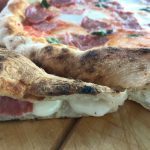 What happens if you take one recipe, use the same amount of ingredients and the same process and only change the brand of flour you use? 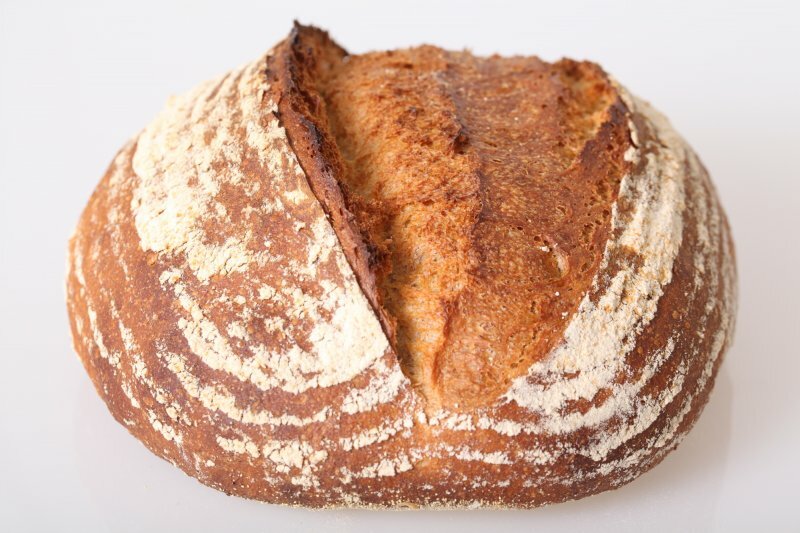 We were curious to find out how much difference, in taste, texture and appearance, there would be between a bread made with good quality organic stone ground flour compared to one made with one of the cheapest supermarket flours we could find. The only difference between version 1 and version 2 in this experiment is the flour brand, the rest is exactly the same. So, how shocking are the results? read on to find out! From left to right: Version 1 to 4. See the difference in crust and color. The most important comparison is the one between version 1 and 2. Version 3 was added mainly to see if, with a little tweaking, version 2 could be ‘upgraded’. The expectations were the cheap flour would be lacking in protein content, and also taste, compared to the stone ground high quality, higher protein flour. But the challenge is, you don’t really know the protein content because this information is almost never mentioned on the package (at least that is the case here in Holland). We only know from our miller that the organic wheat flour we used for version 1 has a protein content of between 12.5 and 13%. Version 4 was added as a quirky side experiment, requested by a friend, using a German ‘Quellstück’ (you can see it as a poolish without yeast, so just flour and water) as a 24 hour preferment. In the final dough we added a little extra yeast to compensate for the lack of yeast in the preferment. 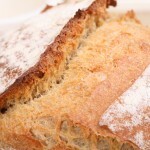 To simplify things we used a yeast version of our staple pain rustique recipe. So we dropped the sourdough in the preferment and made a yeast bread instead of a hybrid bread like we usually do. From left to right: Version 1 to 4. 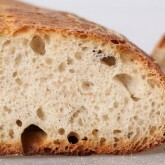 See the difference in crumb color and structure. 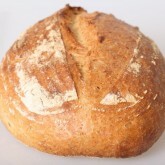 Using the flour we always use, it is no surprise this loaf of bread turned out as expected. 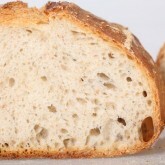 In the picture you can see the color of the crumb is a bit off white leaning towards grey. This has to do with the unbleached, stone ground quality and the presence of a percentage of wheat germ and bran in the flour. The flour itself has a slight yellow hue because of the carotenoid pigments, which also provide better aroma/taste. 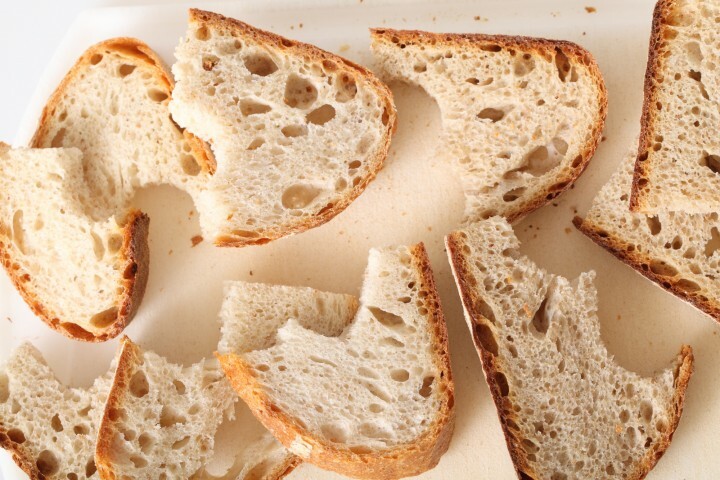 As you can see for yourself looking at the picture, this bread has a very white crumb. This is probably due to the fact that the flour has been bleached. The end result was a very bland tasting bread with a lackluster appearance and, as you can also judge for yourself, no tear or grigne to speak of. The difference in color compared with version 1 can perhaps be explained by the lack of enzymes in the flour. Enzymes are responsible for transforming starch (complex sugars) into simple sugars and the sugars in turn feed the yeast and color the crust. The difference with version 1 is very big and all we did is change the flour, not the recipe! Because all 4 breads in this experiment are made with the short mixing method (combining, autolyse, 4 minute mixing, stretch & folds) all 4 of them have a more or less open and irregular crumb structure. So a conclusion could be, that the recipe is more responsible for the crumb structure than the flour used. We guessed the cheap generic supermarket flour would probably be lacking in protein, so for the third experiment we enriched this flour with semolina flour, also often used to make pasta dough. 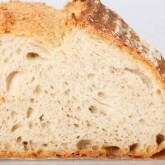 Semolina flour is made from hard (durum) wheat and contains lots of protein and is therefor considered a strong flour. We added an amount of semolina to the poolish so it could soak overnight. We did this because it was rather coarsely ground. What we expected happened, version 3 of the bread has a better oven spring resulting in a nicer tear (grigne) and opening of the crust. The taste was a little bit better compared with version 2, but still did not come close to the complexity of taste we got with version 1, the stone ground organic flour version. As a separate, some would say quirky, and fourth experiment we tried to see if there is any difference between using a poolish and a German ‘Quellstück’. We never used a ‘Quellstück’ before and we had no idea what it would mean for the end result. So the only thing we changed to the recipe was that, instead of a poolish (yeast, flour, water / 12 hours), we used a ‘Quellstück’ (only flour and water / 24 hours). The ‘Quellstück’ smelled rather musty after 24 hours and the same smell unfortunately ended up in the final dough and baked bread. 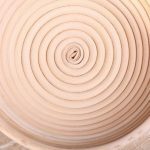 Although we used the exact same amount of water as we did with the other three recipes, the dough felt much wetter and was lacking in strength which made it very hard to shape. As you can see looking at the picture, there was no nice oven spring and the bread ended up with a very thick crust. All in all we rated this version as the absolute worst of the bunch. So, this was part one of the flour experimentation scheme. The next part will be all about windmills and stone ground flour. We are interested to find out if, how and why flour from different mills will give (dramatically?) different baking results. As you can judge from the above, we are very pleased with the flour quality of our regular provider De Zandhaas. But we do expect that flour from other windmills will also give great baking results. We will keep you posted. 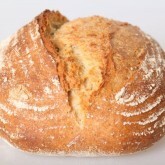 Plus we would be very interested to hear about your experiences with flour quality in bread baking! 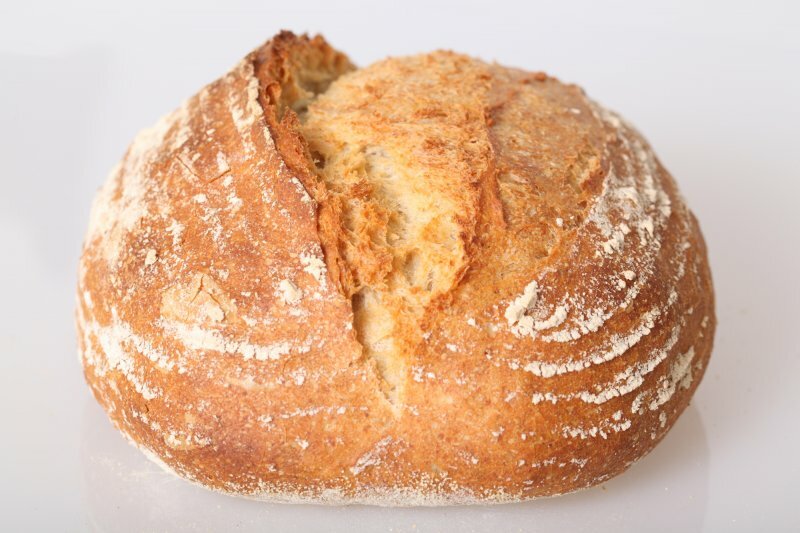 Recently two baker friends switched from generic supermarket flour to Zandhaas windmill organic stone ground flour and independently told us ‘this is a totally different product’. The feel, the smell, the baking, everything has improved. One friend said: “It smells like wheat fields.” Which was, we think, picturesquely well put. A colleague of mine likes to say: there is no such thing as a bad flour only an unsuitable one. Each flour is suitable for a different kind of baked goods. I, myself, was planning to go on that same venture, to bake the same bread with different white flour brands. I believe that every baker should do the same. This way if the baker doesn’t like the result of a certain flour for a white SD, it is possible that using it for a yeasted bread will give excellent results. Thank you for sharing your knowledge. We did find that we do have developed a preference for certain flour brands that give the best result. We still keep on experimenting and especially trying flour from different mills in our neighborhood, we do like to support them too! I don’t know how far you’ve gone with your mill to mill experiment, but I think I know why mill to mill flour results might differ. In the U.S. the milling companies buy wheat from farmers across the country, probably Canada as well. Wheat of different varieties (hard and soft, spring and winter, red and white, etc.). They then mix the different types to produce the flour formula they want to market. Unless two mills in Holland are milling exactly the same wheat, grown in the same area, and mixed to identical formulas, your results will probably differ. Protein content is listed on flour sold in the U.S. so we can help ourselves out by looking at that. Some of the milling companies will also tell what type wheat they use, and where it was grown. We want to thank you for taking the time to add your very useful comment to the subject. We have found that talking to the miller (because of the lack of info on the bags in Holland) is the way to find out about things like area of the wheat and protein content and other info on how they operate. Smaller mills (often run by volunteers) usually only mill a small selection of flour themselves and often sell flour from other mills. In Holland the distances are not that vast, so sometimes it really pays to try a few different addresses to get the right flour. Is it really just protein content (gehalte)? The cheapest flour I could have access to – from an Aldi, though I haven’t ever used it for my bread – records the protein as 13g per 100g. I’ve mixed a similar flour with organic spelt flour and had pretty good results. 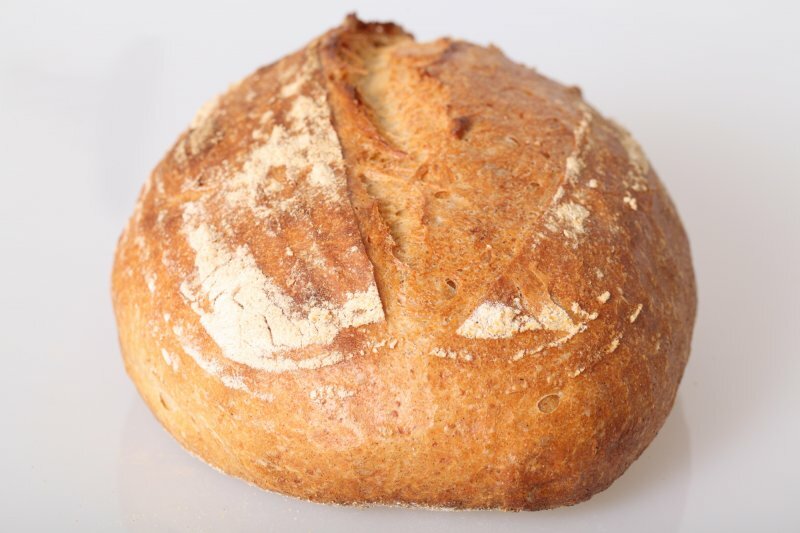 I think it’s probably common sense to assert that better quality flour makes better quality bread, but for those without a miller round the corner or a constant supply of quality flour (or money to buy it) what are some halfway house solutions? 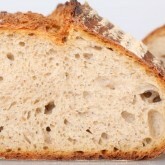 Focusing on the protein content is indeed a simplification, but it is an important factor for bread baking. The mills are just great if you can find one close by of course and very often they are very reasonable with their prices. If this is not an option we would suggest trying different flour brand from the supermarkets because there can also be a (big) difference between them. 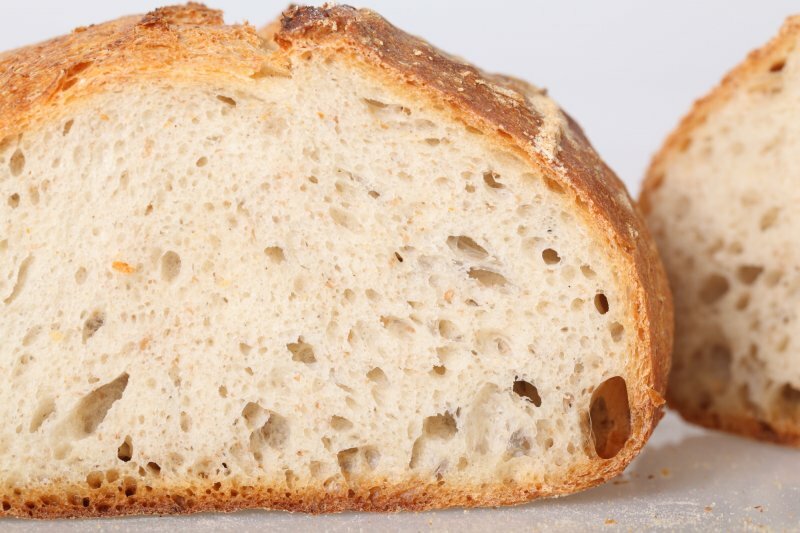 The flour you mention could be great for bread. Mixing like you did is a great option. This is also what we did with option 3, using the durum wheat / semolina in combination with the cheap supermarket store brand flour. This durum flour can also be found at Turkish supermarkets in Holland at a good price. 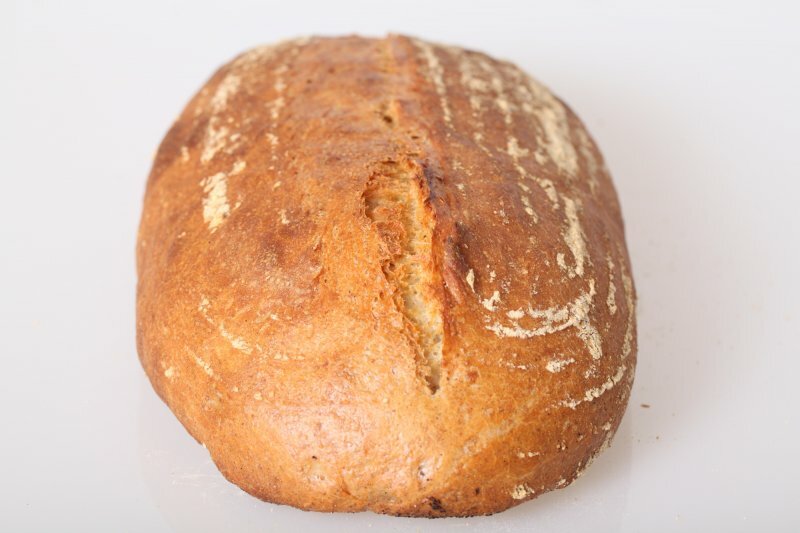 And more and more we see supermarkets offer organic versions of wheat flour, that are a little bit more expensive but also give better result in terms of baking results and taste. This way you would still be able to bake a very good and healthy loaf of bread without any additives and enhancers for around 50 to 60 cents. Wat een leuk en nuttige test hebben jullie gedaan 🙂 Vooralsnog heb ik met name ervaring met wals/ cilinder gemalen franse bloemsoorten (Tarwe T65). Deze zijn overigens zonder enige broodverbetermiddelen o.i.d. Nu ben ik benieuwd welke aanpassingen jullie doen als jullie met een steengemalen bloem werken (langer/ korter kneder, meer/ minder water e.d.). En zit er dan nog veel verschil in een bio steengemalen en en niet bio steengemalen? En gebruiken jullie broodmandjes om het deeg te ondersteunen zo ja welke? Alvast dank voor jullie reactie en keep up the good work! Dank voor je leuke comment. Wij kunnen niet echt van aanpassingen spreken omdat we vrijwel altijd met steengemalen bloem en meel werken voor ons brood. We doen wel voortdurend kleine aanpassingen, afhankelijk van het seizoen en bij iedere nieuwe zak, omdat er altijd verschillen zijn (denk zomer- en wintertarwe bv). We kijken naar de graansoort en naar het eiwitgehalte. Je ziet bij de bio bloem die wij gebruiken dat ze meer eiwit bevat dan de niet bio die wordt aangeboden. Wat betreft het kneden zou je dan een aanpassing doen. Dus het antwoord is dat je op basis van ervaring continue kleine aanpassingen doet, zodat het deeg er uit ziet en aanvoelt zoals je dat voor ogen hebt. Wij gebruiken vrijwel altijd mandjes voor alle ‘rustieke’ broden. Zowel riet als houtvezel, vaak door elkaar, dat maakt ons niet zoveel uit. Vooral met de nattere degen en langere rijstijden geven de mandjes steun en vorm aan het deeg. In onze shop bieden wij zelf een uitgebreide collectie mandjes aan, misschien heb je dit al gezien: (www.weekendbakery.com/websh…ijsmandjes). Nice experiment! I would like to know which supermarket your generic supermarket flour comes from. Currently I have to live on a very small of money. I tested two generic supermarket flours, The Albert Heyn Basic flour, which was lacking taste and did not feel well in my hands, and the Lidl Belbake which gives a very reasonable bread, at least better than any bread from supermarkets in my neighborhood. I didnt make a poolish but a rather dry biga. The supermarket flour we used is no longer sold under this brand name (Euroshopper), but the AH Basic is probably very probably the same stuff. We know the AH biologische tarwebloem gives good results (also 11%) but is expensive in comparison. 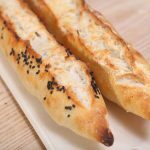 We can suggest using durum wheat from a Turkish ‘supermarkt’ and combine this with your basic flour from Lidl. Normally this flour has a higher gluten content and is also reasonably priced. Just keep trying different flours from different supermarkets, they could all be different but some may be better than others. Good luck with everything and great you are baking your own! Other thing is that in the Lidl Indische buurt we often see Maroccan women of a certain age buying substantial amounts of this flour, and my girlfriend started to talk with them. There we found out that there are a lot of Marrocan women bake their own bread, and that they prefer Lidl flour over the Albert Heyn. Now we allso know that these women bake their bread with a culture leaving some dough for the next bread, and actually I am quite curious to know what kind of bread baking knowledge these elderly marrocan women have just in my very own neighbourhood. That is such an interesting story to share. I am sure your girlfriend could approach them and talk a bit more about bread or get some tips. 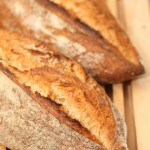 They have valuable knowledge and for sure inspirational recipes and breads. Very interesting post. 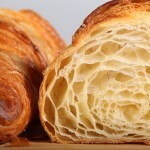 I am surprised that the structure of the breads is so similar. It would be interesting to know the protein content of the supermarket flour. I’m going to check out more of your blog now. P.S. Nice to see I’m not the only Dutchman with a food blog in English. MAJOR AND EPIC FAILURE in all levels, color, texture, crumb, crust and the worst was the taste. The loaf was brick-like dense, without any notable oven spring, heavy like a rock, pale as cholera-infected patient…and major YUKKKKKKKKKKKK in taste. In all levels, that loaf could not meet anybody’s appreciation— not even ducks— so it had to go into trash. 2- As per my friend, it’s the low content of the protein in the flour, that was unable to produce gluten strands enough to make the dough rise and well ferment. So i checked with the miller about the protein content, but he was unable to provide information about that matter. So honestly i have no idea what went wrong here. Maybe you guys from your experience with this could be helpful in this. To be honest your 65% whole wheat bread is a major element in my baking repertoire which i cannot afford not having all the times. So i’m looking forward to your input and help in this matter. Thanks guys, and sorry for the lengthy post. Of course your friend might very well be right. 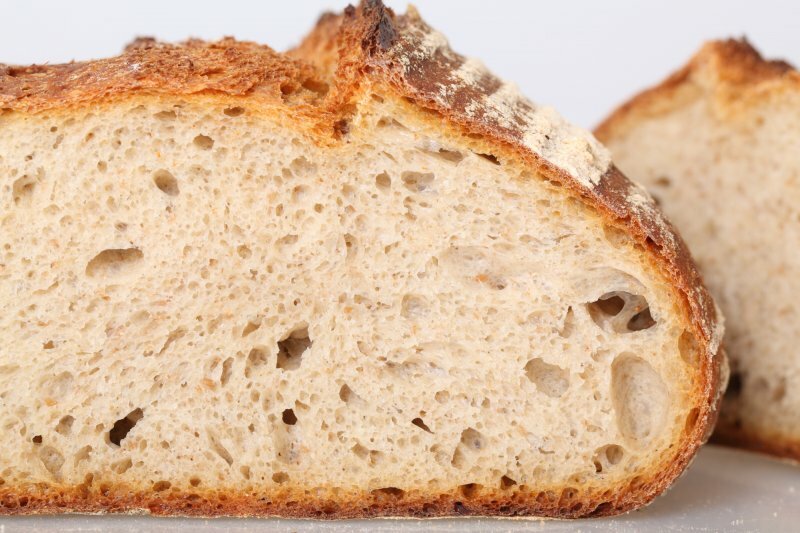 It is important to distinguish between calling flour ‘good flour’ because there is nothing wrong with it and ‘good flour’ as in good for bread baking. So flour can be of good quality and still be not very suitable for bread baking of course. But that is something that is harder to determine if the miller cannot tell you anything about the protein content. The only thing you have now is the result of your bread baking which shows a very disappointing result. But with your other flour you were very able to make a good loaf?! Next to that there is the starter. You should be able to determine by smell if there was anything wrong with it. But judging from your story we would agree that it is more likely the flour is the cause. 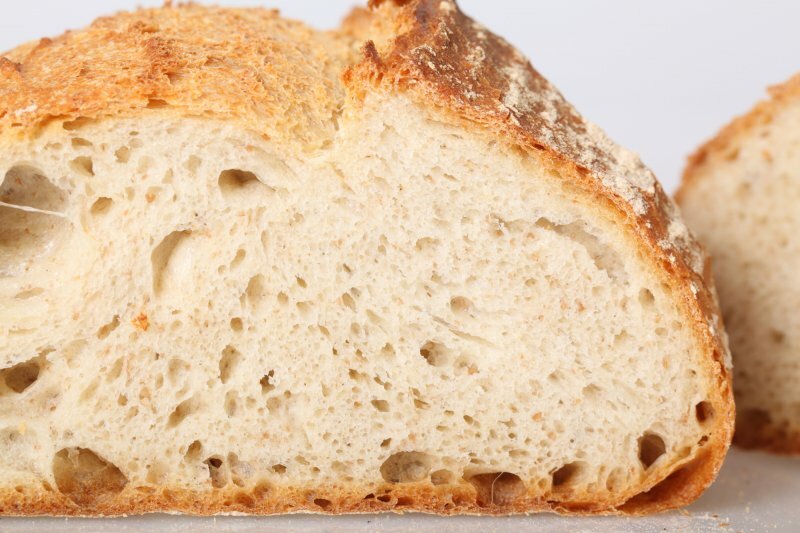 From our own testing and experimenting we know how much difference flour can make to the quality and texture of your bread. 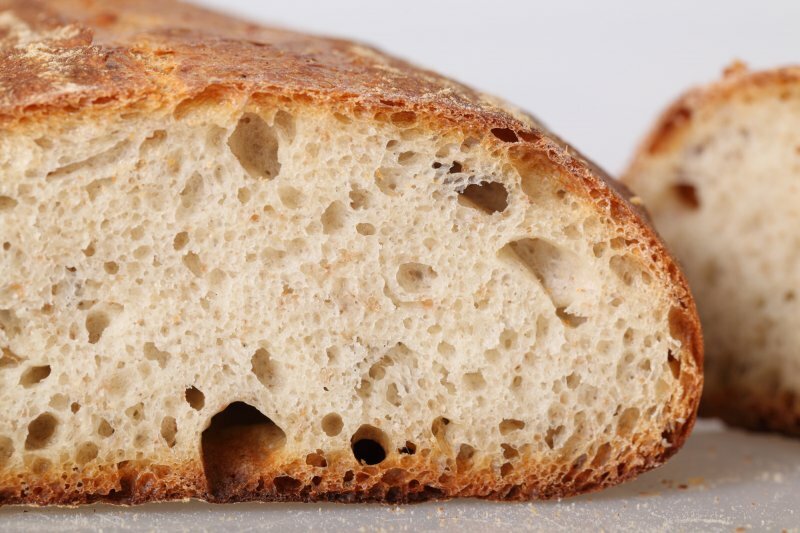 So the quest for the best bread flour (with good protein content) is an important one. 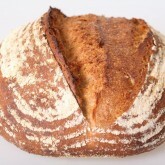 The only thing to do now is to bake another loaf with good bread flour and your starter and see what comes out. Binnenkort ben ik in de buurt van Santpoort en ben dan van plan om even bij de molen langs te gaan om tarwebloem te kopen. Ik zou graag willen weten welke soort jullie precies gebruiken . Wij gebruiken de eko tarwbloem, die kun je in principe krijgen per 1, 2.5, 5 en 25kg zakken (maar vast ook nog in andere hoeveelheden mocht je dit willen). We hebben net een tweede experiment gedaan met tarwebloem van 5 verschillende molens (binnenkort een verslag) en ik kan je zeggen dat de uitkomst voor ons weer een blije bevestiging was van waarom we zo dol zijn op de Zandhaas. Smaak is natuurlijk heel persoonlijk en het was heel opvallend hoe alle vijf de bakresultaten echt een andere smaak hadden (er kwamen overigens allemaal heel goede broden uit, in tegenstelling tot als je bakt met het pakje ‘goedkoopste supermarkt’ bloem, dat had echt kraak nog smaak) dus het gaat hier ook om wat je persoonlijk het meest aanspreekt. Maar het is in onze optiek zeer zeker de moeite waard om de Zandhaas te proberen (alleen geopend op do, vrij en zaterdag!). In het kleine centrum van Santpoort zit ook nog kaaswinkel ‘Amuse’ (www.lamuse.nl/), ook een bezoekje waard als je toch in de buurt bent en echt van kaas houdt. Heel veel plezier met het bezoek en het bakken. Je had bij mijn bakery shop bestellingen een zak meel meegestuurd, zodat ik zelf eens kon vergelijken. Dat heb ik gedaan, kijk maar eens op www.lekkermelig.nl/meelwetenschap/. Ik had niet verwacht dat het zulke grote verschillen in bakeigenschappen zou opleveren. Broodjes van het zandhaas meel waren in mijn vergelijking toch echt behoorlijk veel beter. Natuurlijk is het in een houtoven wel wat lastiger bakken, maar ik heb de boel gelijktijdig gemaakt, vlak achter elkaar gekneed en gevouwen en gelijktijdig gebakken. Ik heb het niet opgemeten, maar ze waren echt veel steviger en een mooie ovenrijs. Heel gaaf dat je ook aan het experimenteren bent en dat bij jou de houtoven-variant belicht wordt. Een heel interessant verhaal en het bevestigt toch ook wat wij aan deze kant met onze steenoven aan resultaat zien. Zo zie je ook dat het niet alleen je eigen shape en score kunsten zijn maar zeker ook het meel dat voor verschillende resultaten zorgt. We zijn druk bezig om het verslag van experiment twee af te maken, het experiment met meel van vijf verschillende molens. Heel veel foto’s ook erbij, zodat je de verschillen goed kunt zien. Helaas niet proeven natuurlijk, maar dat hebben we wel met een paar andere broodliefhebbers gedaan. Wij vinden het in ieder geval de moeite waard om te experimenteren en vergelijken en uiteindelijk een blokje om te rijden om je favoriete meel te bemachtigen. We hopen ook van jouw experimenten nog veel meer te horen. Lutz is right, your Quellstück was already overfermented. You can prevent that from happening by adding a bit of salt (ca. 1.8 %). A Quellstück is the same as a (cold) soaker, a Brühstück would be a hot soaker. I work a lot with soakers (not only for coarse grinds, Lutz), but also for whole grain flour (Peter Reinhart’s method from “Whole Grain Breads”), always with a little salt added. Thank you for the addition. So, if I understand correctly, you do make a (whole grain) flour and water soaker called Quellstück? 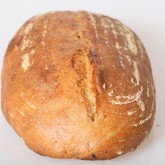 A Quellstück is never made with flour and water, but with cracked grains of wheat or rye for 4-12 hours. You made an autolyse mass, but you stored it too long, thus the enzymes degraded the gluten chains and your dough seemed wet and had no strength. Furthermore, your flour-water-mass smelled strange because it fermented spontaneously. For an autolyse you should store the mass max. 20-60 minutes, otherwise the gluten will be degraded. Thanks for enlightening us! Our friend told us he read about this (mixing water and flour and leaving it for 24 hours) and wanted to try it and we were a bit confused, because later, thinking about it, this thought came up that the word in German was more reminiscent of a soaker. And what you mention happened of course, who knows what was in it? !